A round-up of all improvements and changes to the Buzz platform in version 2.0.64, available on August 25, 2016. Added a Logout of Google Drive button to the User Menu, so users can easily end their Google Drive instance. 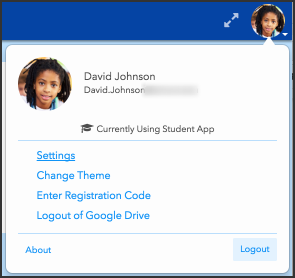 Made many updates to the Teacher app to improve accessibility for users with a visual impairment. While many of the updates were under-the-hood, users may notice improved keyboard navigation throughout multiple tools and slight style changes to selected and focused buttons and menu options. Added messaging to the activity editor that informs users when the activity is using a resource that is outside of the course, and gives them the opportunity to change the resource. Fixed an issue that mistakenly made some course subscriptions inaccessible from the Digital Library. Added fixed widths to the Weights tab in the Editor to fix alignment problems that would occur on small screens. Fixed issue that allowed filenames to overflow a field, rather than wrap. Revised the way custom entries on the Main Menu function, so that choosing one no longer automatically opens the Course Chooser without need. Righted upside-down expand/collapse arrows in the gradebook. Fixed an issue that kept scoring options in Multi-Outcome Scoring courses from updating without refresh when users changed an activity from "non-gradable" to "gradable." Updated the student app activity Details window to show points possible for Multi-Outcome Scoring activities. Added a confirmation dialogue to the grade editing feature (Performance tool) when closing the window, so teachers won't accidentally cancel a grade change. Revised rich text editor's fullscreen formatting to better accommodate the color selector. Fixed an issue that didn't allow users with both teacher and student accounts to access completed courses in their student account if they had no courses currently in session.